Barra ready to bite crazily after 5 months of no fishing! We have limited spaces available on selected dates for our “Build-Up” Sale Packages, so get in quick to reserve your spot now! 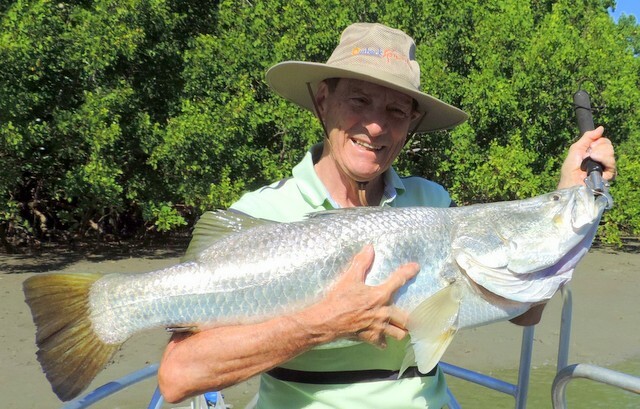 From May to September, the Barra Lodge is used for Aboriginal culture and nature tours, but a spot of fishing is always on the cards… and big barra are ready, willing and able, as this happy guest discovered last month. Come the Build-up months of Oct/Nov, it’s all fishing and the barra will be busting! That’s right. 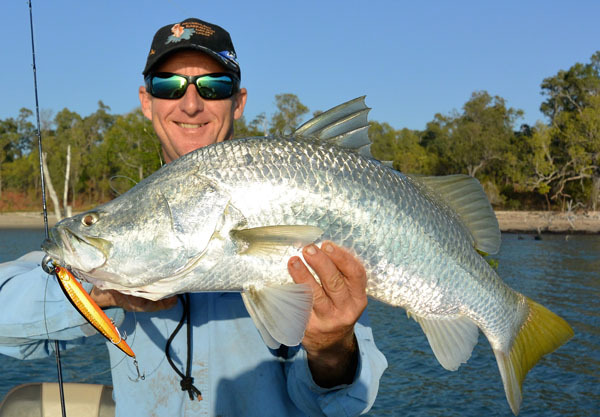 If you are lucky enough to catch one of the $10,000 tagged barra while at the Lodge, Outback Spirit Tours will match that value ($10,000.00) against your next Lodge booking. How good is that! Of course, if you catch the $MILLION FISH itself, we won’t be matching that, but we’re sure you’ll be happy enough anyway with A MILLION DOLLARS JUST FOR CATCHING ONE BARRA! There are still great spots available during the Barra Lodge’s limited Build-up season during October and November. With the great special deals we currently have available, there’s no better opportunity than now to participate in the competition to catch a prized tagged barra. 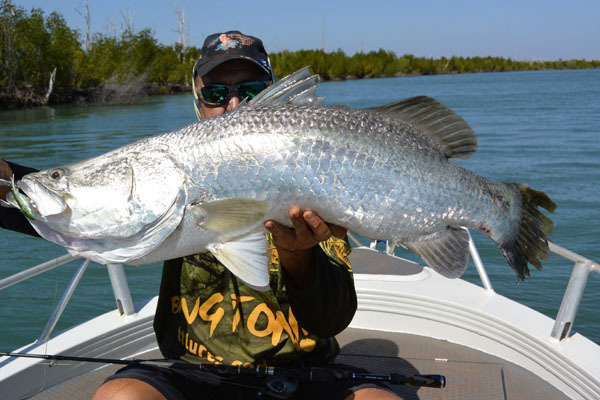 It’s also when you can expect some outstanding barramundi fishing as the Build-up is prime-time barra fishing. 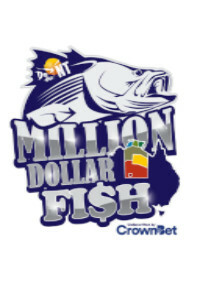 Click on the following link to register for the Million Dollar Fish. 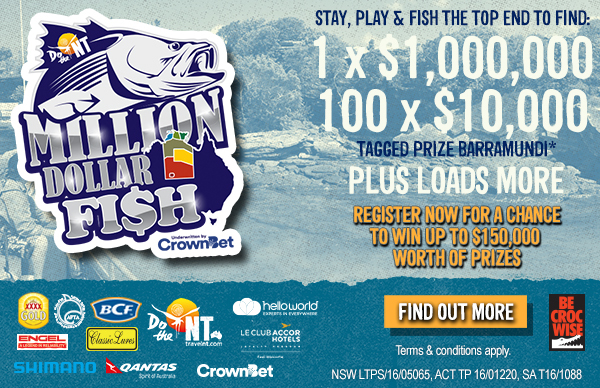 Call 08 89831544 or email barralodge@nafa.com.au now to find out how you can fish for the Million Dollar Barra or just a Million Barra! Sunset at the Barra Bar, and a chance to compare notes after a great day’s fishing in this incredible pristine remote location. 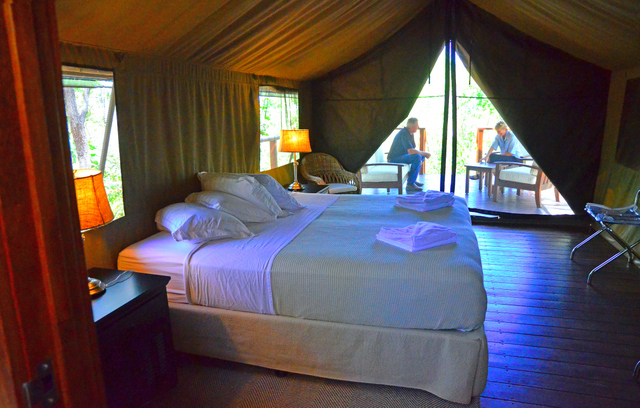 Guests are surprised to discover the plush brand-new safari suites are also fully air-conditioned… but first you need to close the flaps. 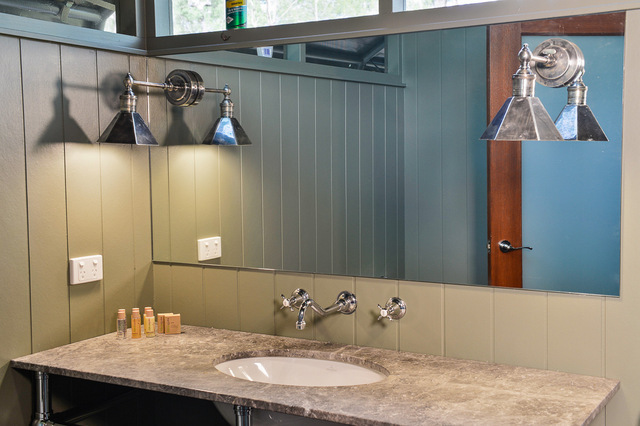 The Arnhem Land Barra Lodge is the only fishing lodge in Northern Australia with ensuite amenities… and we’re talking 5 star. Here at the Arnhem Land Barra Lodge we are starting to get excited for our return to full-on fishing in October once our first bus touring season is completed. Recent reconnaissance missions by our guides to the varied river systems at our disposal have found the fish hungry and in good numbers. These areas have been virtually untouched through the middle of the year, and I know some lucky guests will get some mind-blowing barra fishing this “Build-up”. I even managed to sneak out on the water myself during a short break in touring, and I was stoked to boat my first metre-plus barra for the year (102 cm) casting a soft vibe over sunken timber. During this session, I was accompanied by our Lodge mechanic Steve and between us another 59 barra came aboard for release, with several in the mid-80cm range, including Steve’s PB which measured 84cm. Closer to home, the magnificent Liverpool River continues to produce, with several of our bus touring clients adding their name to the metre board back at the lodge. The flats fishing at the mouth of the river has been particularly good, with some awesome sight fishing in only a couple of feet of water. With the amazing backdrop of shiny green mangrove fringes and red rock cliffs, it really has to be seen to be believed, and yet it is just seven minutes from the ramp (we certainly are spoiled up here!). 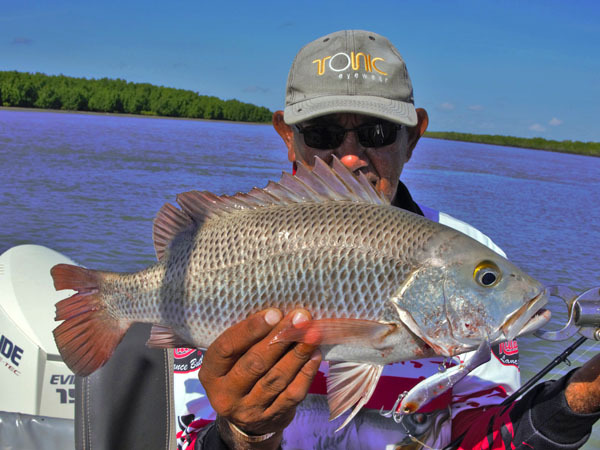 Further up the river, submerged rock-bars continue to produce both big barra and monster black jewfish. One lady guest in her 80s enjoyed a half day fishing as part of the “Explore” Arnhem Land luxury 4WD coach tours. She had an amazing adventure, and did a great job fighting and landing a 110cm jewie, a fantastic effort on 4000 size spin gear and she couldn’t wait to show her grandkids! 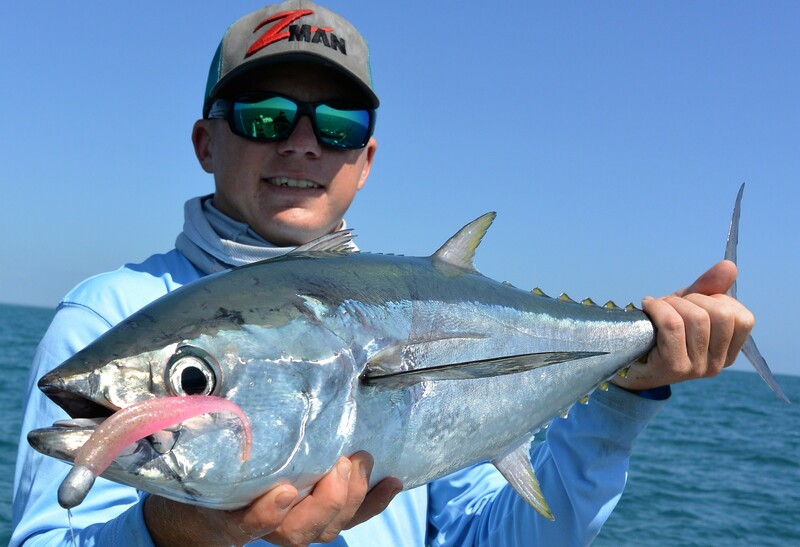 I don’t want to neglect mentioning the world-class blue water sportfishing close to Maningrida; and as I write this, literally acres of longtail bluefin tuna are smashing into bait balls only 15 minutes from the ramp. Add to this the schools of metre-plus queenfish, Spanish mackerel, giant herring and big trevally of various species, and it certainly looks good for some amazing days out on the blue water in Oct/Nov. During a recent trip to a local inshore reef to secure some fine seafood for our guests, we boated a succession of coral trout, golden snapper (fingermark) and the delicious blackspot tuskfish (bluebone) until massive schools of GTs and big brassy trevally found us and quickly pounced on any offering cast overboard. These bruisers don’t know when to quit, and I must admit after catching just one I had had enough and was trying to keep my lure away from them! 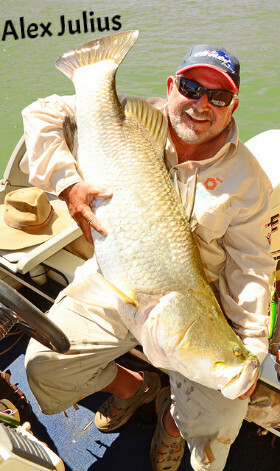 The “Build-up” is renowned for big barra and big numbers of barra, plus bountiful blue water species, so if you want the total Barra Lodge experience, including the 5 star luxury bush refurbishment, come and visit us this October-November and see why our area rates as the number one sportfishing destination in Australia. I believe we have the finest team of professional fishing guides in Australia, with unparalleled local knowledge and the ability to impart that knowledge and skills to maximise your fishing success. Recently, Lodge Manager Shaun Taylor managed to sneak out on the water during a short break in the bus touring season, and was stoked to boat his first metre-plus barra for the year (102 cm)… casting a soft vibe over sunken timber. “I know some lucky guests will get some mind-blowing barra fishing this Build-up,” Shaun said. The Lodge’s iconic indigenous fishing guide, Lance Butler, is always testing his fish-catching creations. This is his new “paddle-tail” wooden minnow, and a plump mangrove jack that fell for it. As reported, GTs like this are often in plague proportions and need to be driven away from! Lodge Mechanic, Steve Moran, checked out the Lodge’s famous Queenie Reef… yep they were lined up and voracious. Steve also managed a day off to wrestle snappers instead of spanners. Golden snapper like this are plentiful and easily accessed by Lodge clients… and they are another of the quality table fish on tap in these remote tropical waters. During the Build-up, longtail tuna feed on the surface in schools as big as an acre and the fishing is fast and furious. Top guide Declan Williams with a typical specimen. Shaun with a tasty coral trout jigged up off an inshore coral bommie. 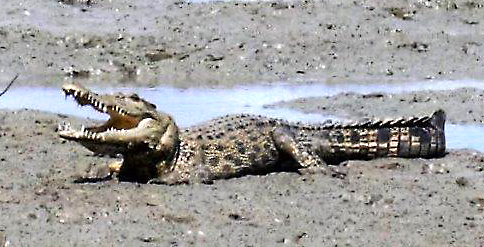 You never know what will jump on next along the pristine inshore waters of Arnhem Land. 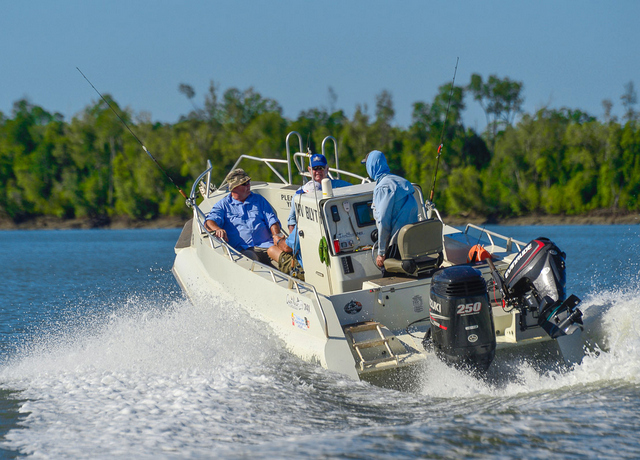 Our fleet of magnificent OceanMaster sportfishers are equally at home on the fish-rich blue yonder as they are in the barra creeks. October and November is Build-up time at the Lodge and, with water temperatures on the rise, the barramundi’s aggressive nature escalates. The Build-up is characterised by glass-off calm mornings followed by a light afternoon sea breeze. The Barra Lodge’s top record barra catches have come from the Build-up, and some huge fish have been amongst them. In previous years, it has not been unusual for triple-digit barra catches to be reported by a single boat for a day’s fishing during October/November. 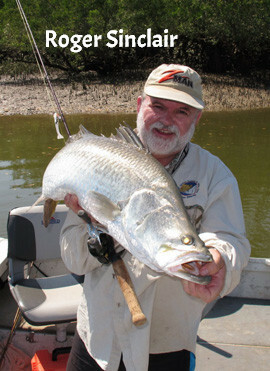 The Barra Lodge guides are highly experienced and masters at locating barra in the vast river and estuary systems along our section of coastline. With years of guiding experience between them, they are keen to impart their expertise to Lodge guests and assist them to land that fish of a lifetime! Barra congregate in these river and creek mouths awaiting the onset of Wet Season rains and exhibit a vigorous appetite; they are no longer lethargic as in the cooler Dry Season months and will readily ambush any lure placed in their vicinity. 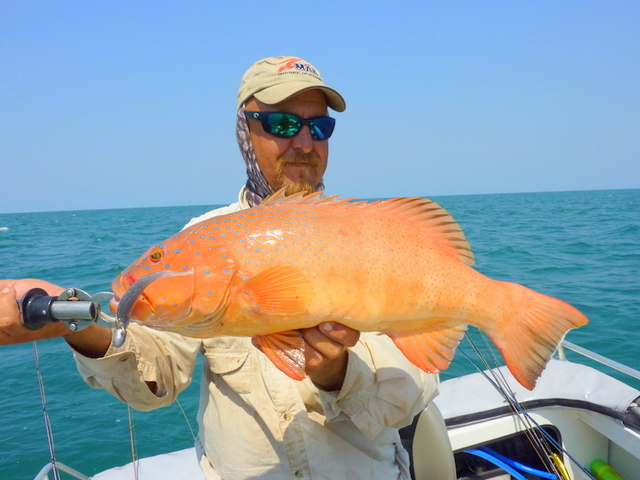 Similarly, slight seas provide plenty of opportunities to comfortably fish offshore plus offer excellent conditions to travel the coast to more remote rivers and creeks. 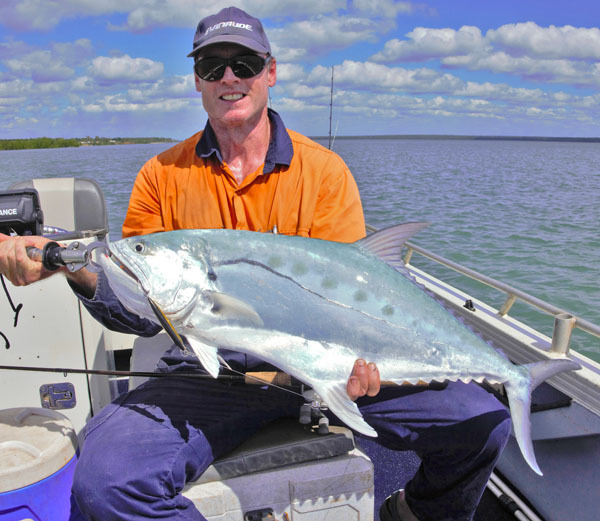 The blue water fishing options along the Arnhem Land coast are simply world class. This is a remote area and rarely fished. Consequently, anglers are able to engage with endless schools of pelagic species that are only too eager to smash a surface popper or stick bait skipped erratically across the surface. Similarly, jigging soft plastics while drifting over inshore reef and rubble will produce a lottery of hard-fighting, culinary-desirable reef fish that the Lodge chef is able to convert into a mouth-watering seafood feast. Availability for the fabulous Run-off in March and April 2017 is filling fast, and that’s no surprise given the early predictions for a bumper Wet Season. CLICK on the link below to check out the Channel 9 Darwin News Report from 26 August last! 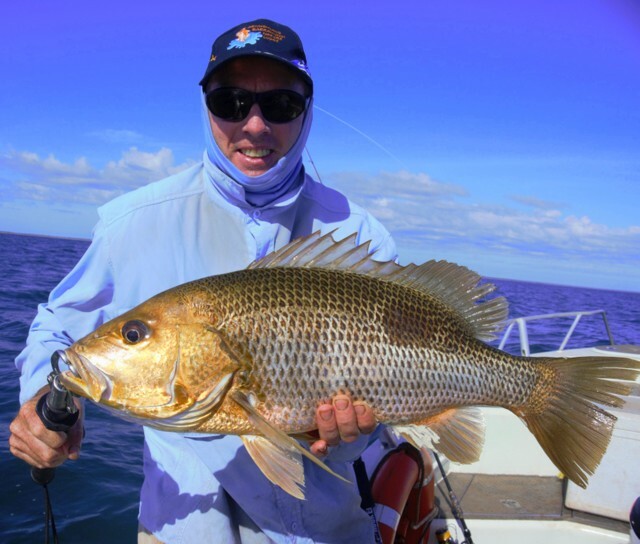 TO ENJOY THE FINEST WILDERNESS BARRAMUNDI AND SPORT FISHING IN AUSTRALIA, GIVE ALEX OR ROGER A CALL NOW! Alex and Roger have both guided many times at the Barra Lodge, and both have the names of happy clients up on the Barra Lodge Metre Board. Additionally, both these expert anglers are multiple-tournament winners and are highly regarded amongst their peers in the Top End. Alex and Roger will be able to impart their extensive knowledge about the incredible fishing on offer in the Maningrida region where the Lodge is located. Discounts only apply to the Lodge pricing content in the standard 2016 price list. This special offer only applies to nominated fishing package bookings accepted after 7th September 2016, on specially selected dates during October/November 2016. Minimum booking 3 nights 3 days fishing. All booking enquiries are subject to availability. These special discounted tours may not be taken in conjunction with any other special offer, tour, incentive or special giveaway. 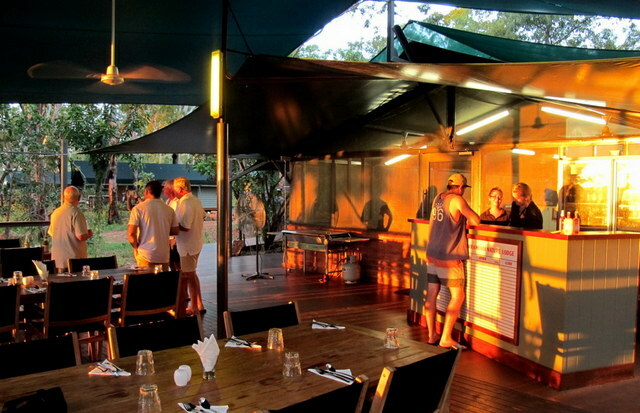 Special discounts and bonus offers applicable to this offer do not apply retrospectively to any existing bookings with the Arnhem Land Barramundi Lodge. Fishing tours available at maximum 4 per boat. Copyright © 2016 Fishing Tropical Australia, Division of Alex Julius Fishing Media Pty Ltd, All rights reserved.